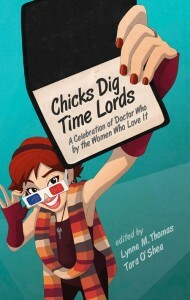 The Doctor Who reading continues with Chicks Dig Time Lords: A Celebration of Doctor Who by the Women Who Love it edited by Lynne M. Thomas and Tara O’Shea. It seems appropriate to write about th is book on International Women’s Day as the book celebrates female experiences, fandom, and perspectives. Squee and all other kinds of love for Doctor Who are openly embraced in the essays in this book. Similar to Chicks Unravel Time this book focuses on the female Whovian perspective. The tone of the book is a bit more casual with more personal reflections on Doctor Who fandom and personal experiences with the show. Unsurprisingly I loved this book. It’s a great mixture of academic style essays and memoir style writings about individual relationships with Doctor Who. The book recreates the sense of community many fans have come to cherish in DW fandom. I found the online communities discussion interesting – partially because it has changed so much since the launch of new DW and and again since the book was published. I wonder how the authors’ experiences of Doctor Who have changed with streaming, changing online communities, and social media. Some of the book’s high points for me were Shoshana Magnet’s essay on gender and race in DW; Lynne M. Thomas’ “Marrying Into the TARDIS Tribe”; Johanna Mead’s piece on costuming, and Carole E. Barrowman’s reflection on her brother’s role as Jack Harkness. I’m following up this selection by reading Anything Goes by John and Carole Barrowman. So far it’s a light read and a wit filled autobiography. This entry was posted in Doctor Who and tagged Chicks Dig Time Lords, Doctor Who, International Women's Day. Bookmark the permalink.